The stove is right at home with the cupboard that I already had. I don't know what it is about this time era, but I am drawn to it in a powerful way. I think it's all the whimsy. Nothing says whimsy like Holt Howard Pixieware. I have acquired my pieces over time, before they became too expensive to purchase anymore. I'm hoping I'll find some at a garage sale for pennies. It's certainly not the value that's important to me. They just make me smile. My crinoline dish collection started with a four piece set for $15 at a local antique store. Of course the drinking glasses had to follow. They look wonderful on the table for Easter. My kids friends have asked them if their Dad minds living in such a girly house. I love the reaction to that question. My daughter will look around like she's seeing the room for the first time, not even noticing that it was girly. The boys have their family room downstairs which is all baseball. I think I'm pretty generous giving them one room! It certainly helps pass the grey days of winter to cook in a fun kitchen. I don't know which of my rooms is my favorite, but the kitchen is a top contender. Blessings today! love all the pink, renee. the stove is darling! the absolute perfect addition for your lovely kitchen. 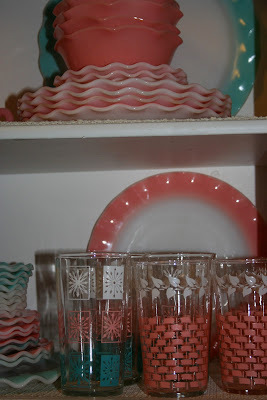 Oh Renee, I love it all...I was so surprised to see that you and I have the same vintage drinking glasses. I haven't seen those pink n white ones cept at my house. I too have that stove/oven. Years ago I had the entire set but they have since been sold and moved to Conn. So cute! 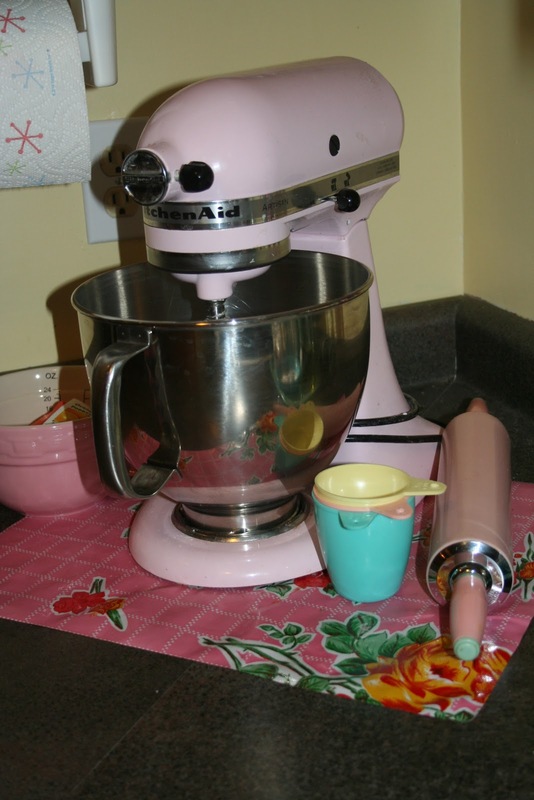 I am wanting to decorate my kitchen all retro. Perhaps I should go with pink and watch my husband flip out about it! I love it all! Gorgeous pink and yes it is girly...but I adore it! I have an old pink colander that I put a small Christmas tree in and placed on my dining room table...so cute along with my pink sparkly elf boot! I just found your blog (via Bluebird Notes) ... and I think I'm in love (lol) You have the most beautiful pictures, and I have already read through quite a few of your posts. I will be back on a regular basis. So glad I found you. How fun! 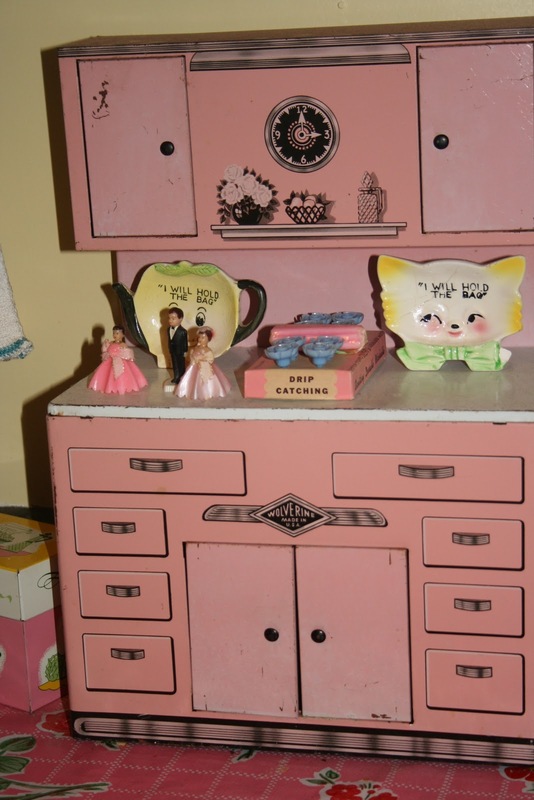 I tried to talk my MIL into painting her kitchen pink once. It would've been beautiful with her collections. She wouldn't do it. I love the salt and pepper shaker and the Pixieware. In all my many antique shop visits I have NEVER seen these. I have seen them online in other people's collections, but never in a store. Strange, I think. They're adorable! I can't believe it!! I actually HAD one of these little stoves when I was little!! I had even forgotten about having one till I saw yours! I had little cookware to go with it. 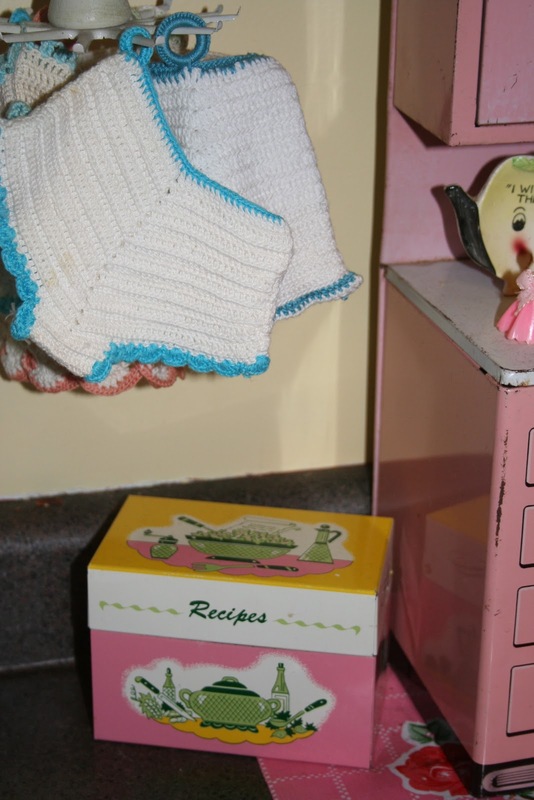 I played for hours with that little pink stove. We had a house fire when I was 9 yrs. old so it si no longer around. I may have to find one for myself. Do you mind telling me what you paid for it so I'll know what to expect??? 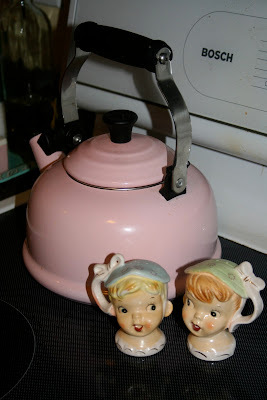 You have some gorgeous pink things and that stove was a great find. Renee, it is fantastic. I love my metal kitchen appliances. Even the orange ones. I know what you mean. It is almost too hard to describe how wonderful they are. 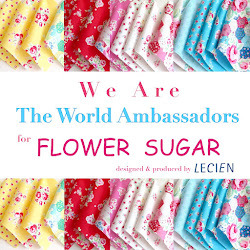 Just the child like innocents and apron wearing Mom images they provoke are divine. Love the pictures. And yes...I just know you and I would do lots of damage together. Love it all! I hope to start a glass collection like that someday too :) thanks for all of you wonderful pictures! Wow, Renee...I love it all! So whimsical and cute! What a lovely collection. 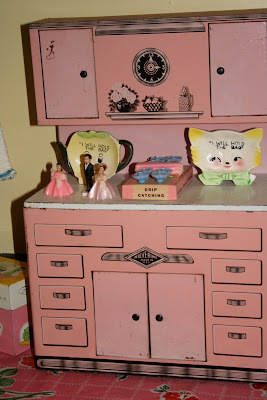 The pink stove is adorable, but the crinoline dishes rock my world! Love them! I just love all your collections! Fun fun fun!! I love it. Love it! LOVE, LOVE, LOVE it! I miss my grandmother's pink stove. It was amazing.